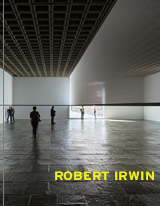 The Robert Irwin Catalogue Raisonné is forthcoming from Artifex Press. The Robert Irwin Catalogue Raisonné will feature a comprehensive inventory of paintings, sculptures, and installations by the artist with complete artwork information, provenance, installation details, exhibition and publication histories, plus high resolution images and additional multimedia. Current and past owners of Robert Irwin works are encouraged to contact Editor Marianne Stockebrand at: mstockebrand@artifexpress.com. We've noticed you're using an older version of your web browser. For optimal performance, please update your browser to the latest version.